Are you getting ready to share books for kids for National Poetry Month? The new children’s book Animal Ark: Celebrating our Wild World in Poetry and Pictures by Kwame Alexander, with Mary Rand Hess, Deanna Nikaido, and photographs by Joel Sartore should be at the top of your list. This isn’t old rehashed material, either. Alexander is is referring to the fact elephants communicate through vibrations, which scientists discovered in 1997. Not only does he reveal interesting facts about animals, but also the importance of conservation. The words aren’t all that make this a powerful book. The photographs by National Geographic photographer Joel Sartore are incredible, too. Every detail stands out crisp against simple black or white backgrounds. How do you fit over 100 gorgeous photographs into one children’s book? The secret is fold out pages. In the back, a fold shows the name of each animal in the book, as well as its IUCN status. Animal Ark is so moving, it just might leave you breathless. Perfect to share the main pages for story time with a class, or cuddle up with at bedtime with kids and go through the fold outs. At the very least, expect children to want to go back to it again and again. Visit Wrapped in Foil blog for the must-see book trailer narrated by Kwame Alexander and suggestions for related activities. Booktalk: With rhythmic, rhyming text and beautifully patterned painting, Fantastic Flowers introduces young readers to 17 flowers that resemble all kinds of things. Budding botanists will be amazed at how much they look like upside-down pants, wild monkeys and even tiny babies! Flowers in shapes that surprise and delight. So it is fun, fun, FUN to read this wonderful biography by Melissa Sweet. It is full of words, too – and bright collages that give the book the feel of a scrapbook. There are tales of vacations in Maine, writing stories for contests, working as a counselor at Camp Otter. Sweet includes a rough draft of Charlotte’s Web that opens, “Charlotte was a grey spider who lived in the doorway of a barn.” He struggled with the opening, jotting down different ways into the story, and then set the story aside for year. 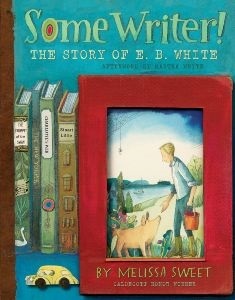 What I love about this book is how Sweet weaves the story of E.B. White with illustrations that capture specific moments in his life. She even makes grammar fun! E.B. White is famous for his writing advice to Omit Needless Words. He’s also famous for explaining the difference between affect and effect (I know this because I have looked it up in The Elements of Style) and when to use an exclamation point. Sweet also has fun introducing readers to the times in which E.B. wrote. Opposite the Table of Contents she explains how a manual typewriter works. And of course there is back matter: an afterword by Martha White (E.B. was her grandfather) with family photos, a timeline of his works, a selected bibliography of works by E.B. White as well as works by others that curious kids might want to check out. And – yay! – there is an index for impatient folks who want to know right this minute where to find something about chickens or pigs or the nitty-gritty stuff of Stuart Little. Our schools in Berkeley Unified School District educate all students and promote a “full-inclusion” model. Students with all types of abilities are all integrated into our classrooms, and I believe this benefits all of us — students and teachers. But seeking out picture books that represent the experiences of different students is not easy. We must make special effort to be inclusive in our books as we are with our schools. I am happy to share a new picture book that shows a slice of life of MyaGrace, a teen with special needs who wants to be included in activities with her friends and classmates. This story exudes joy and will make a terrific addition to home and school libraries. MyaGrace’s mother writes the book, and it is told from MyaGrace’s perspective. MyaGrace is excited to go to her school’s big dance with her friend, Emily. She needs to choose a special dress and get ready. The introduction explains that MyaGrace has special needs and abilities, but the text just shows this event from her perspective. Read more at the full post at Great Kid Books. 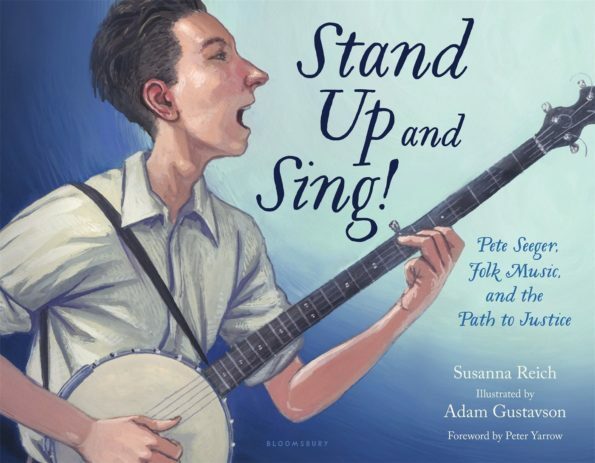 Booktalk: Pete Seeger was born with music in his bones. Coming of age during the Great Depression, Pete saw poverty and adversity that would forever shape his worldview, but it wasn’t until he received his first banjo that he found his way to change the world. It was plucking banjo strings and singing folk songs that showed Pete how music had the incredible power to bring people together. Using this gift throughout his life, Pete encouraged others to rally behind causes that mattered–fighting for Civil Rights, ending the Vietnam War, or cleaning up the Hudson River. For Pete, no challenge was too great, and what started out as a love for music turned into a lifetime of activism and change. His greatest talent–and greatest passion–would become an unforgettable part of American history. “That song really sticks with you, doesn’t it?” Dr. King said. “We Shall Overcome” spread throughout the country. In churches and community halls, at civil rights gatherings and protest marches, people stood arm in arm, their voices forming a bond of hope and determination. Over at Growing with Science blog today we’re highlighting a new Middle Grade book, Insects: The Most Fun Bug Book Ever by Sneed B. Collard III. How much fun is the book? Let’s take a look. The information is handled in a less-than-serious way, as well. For example, there is a table in the introduction comparing the known number of species of different animal groups. Kids might not look too closely until they realize one of the categories is comic-book superheroes (there are more than 1,000 different comic-book superheroes according to the author.) The conclusion that the number of insect species far exceeds that of other animal groups comes through loud an clear, regardless, and if adding superheroes makes a reader pay more attention, then good for Mr. Collard. Some parts are as the reader might expect. The illustrations are color photographs, mostly taken by the author. On the other hand, on page ten is an illustration of an insect’s anatomy hand-drawn by the author’s son. The back matter includes the standard glossary and index, but no list of books or websites to learn more. Instead the author encourages kids to go outside and observe insects in the real world. All in all, Insects: The Most Fun Bug Book Ever is a must-have title for budding entomologists and kids interested in biology. It will also appeal to kids who enjoy their nonfiction on the lighter side, making it an excellent choice for reluctant readers. Be sure to check out a copy today. Booktalk: Look out! There’s a shark! 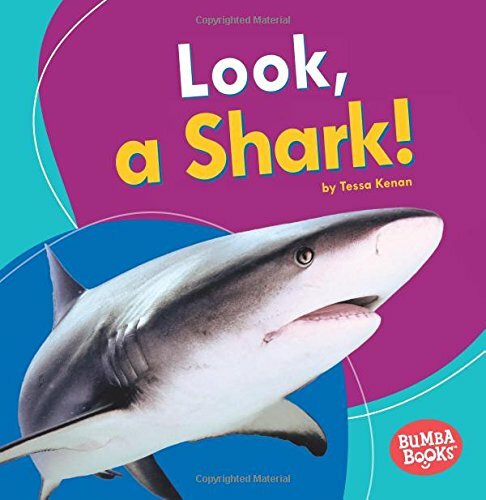 Learn all about this famous predator and see full-color photographs of the variety of types, from a small pup (baby shark) to a Great White. Diagrams will help beginning readers identify the body parts of sharks. There are many kinds of sharks. One is longer than a bus. One is shorter than a ruler. Also available in Spanish as Mira, Un Tiburon!